Declaring “our country is full”, US President Donald Trump on Friday insisted the US immigration system was overburdened and illegal crossings must be stopped as he inspected a refurbished section of fencing at the Mexican border. Trump, making a renewed push for border security as a central campaign issue for his 2020 re-election, participated in a briefing on immigration and border security in Calexico before viewing a 2-mile (3.2km) see-through steel-slat barrier that was a long-planned replacement for an older barrier – and not new wall. Also on Friday, House Democrats filed a lawsuit preventing Trump from spending more money than Congress has approved to erect barriers along the southwestern border. Congress approved just under US$1.4 billion for work on border barricades. Trump has asserted he can use his powers as chief executive to transfer an additional US$6.7 billion to wall construction. Trump, who earlier in the week threatened to shut down the border over the high numbers of migrants trying to enter the US, appeared to walk back his comments Thursday. He said Friday that it was because Mexico had gotten tougher in stopping an influx of immigrants from moving north. 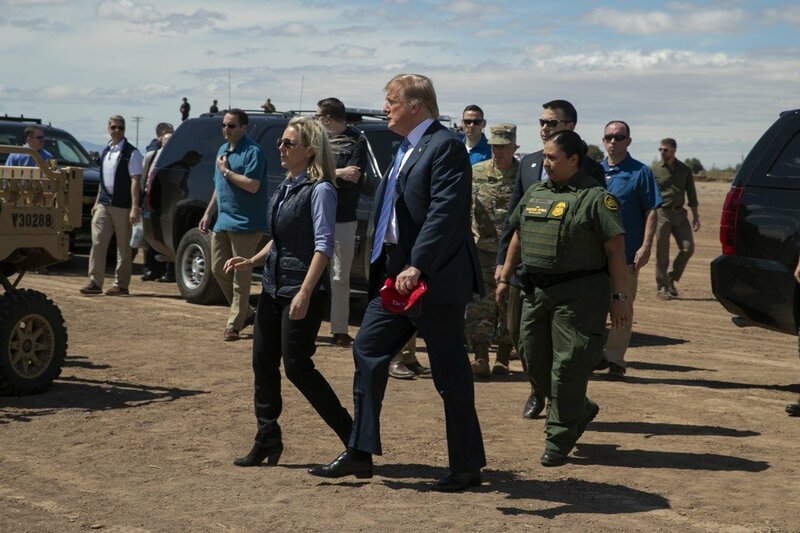 US President Donald Trump walks with Homeland Security Secretary Kirstjen Nielsen as they visit a newly refurbished part of a border wall with Mexico in Calexico, California, on Friday. Trump, as he so often does, mixed fact with fiction when warning of the threat at the border. When complaining about the so-called Flores legal settlement that governs treatment of migrant children and families, he blamed “Judge Flores, whoever you may be”. But Flores was an unaccompanied 15-year-old girl from El Salvador. Supporters of US President Donald Trump stand near the US-Mexico border during a rally as Trump visits Calexico on Friday. He also downplayed the claims of people seeking asylum at the border, declaring without evidence that many are gang members while comparing some of their efforts to find safety in the US to special counsel Robert Mueller’s investigation of Russian interference in the 2016 elections.